VNRE – Aeon Co., Ltd has been licensed by the Department of Planning and Investment of Binh Duong province for the project Aeon Binh Duong Canary Shopping Center in Thuan An District with a total investment capital of USD 95 million. Aeon Binh Duong Canary Shopping Center project has a total area of 62,000 m2 at The Canary Complex project being built adjacent Vietnam – Singapore 1 industrial zone (VSIP 1). Aeon Binh Duong Canary Shopping Center is the 2nd project of Aeon Group was licensed investment in Vietnam after the Aeon Tan Phu Celadon Shopping Center in Ho Chi Minh City. VNRE – After three months of sales, the commercial center (retail floor) at Vincom Center A was filled to 70% of area for fashion, jewelry, high-end accessories; 60% of area for restaurants, cafes, fast food; 70% of area for electrical equipment… Until now, Vincom Center A has completely finished raw building and is installing 70% of electromechanical system, the handover to tenants to finishing interior from April 1, 2012. The project was scheduled to open on October 10, 2012. Besides the commercial center, Vincom Center A includes 5-star hotel named Vinpearl Luxury with nearly 300 rooms, is located from L5 to L8 floor of the building, 3 floors of underground parking (25,000 sqm) with a capacity of about 1,000 cars/10.000 motorcycles. 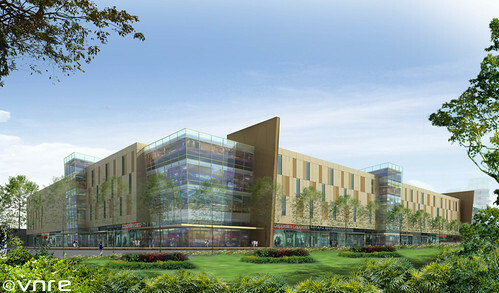 VNRE – The first shopping center – Aeon Tan Phu Celadon will begin construction in mid-2012, with investment capital about $100 million. The Japan’s largest retailer Aeon scheduled for opening this center in early 2014, Vice President and CEO of Aeon Nagahisa Oyama said. Aeon Tan Phu Celadon stage 1 has scale of 3.5 hectares, will be built in Aeon Celadon City SC urban wide 82.5 ha on Tan Ky – Tan Quy Street, Tan Phu District, Hochiminh City. Mr. Oyama said the group plans to build at least seven such retail outlets in Vietnam. 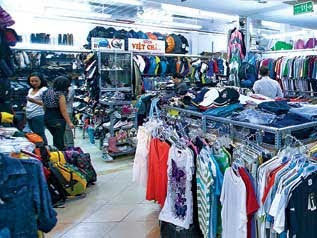 VNRE – The owners of the fashion shops on Nguyen Trai, Hai Ba Trung and Nguyen Dinh Chieu streets in HCM City complain that the retail premises rentals now amount to 40-50 percent, or even 60 percent of the retail prices, the highest ever rentals so far. “The retail premises rent for street-front shops have become overly high, but I still “have to eat humble pie” and accept such high rents. If I don’t accept such a high rent, the premises would be leased to others immediately,” Ngo Thi Bau, the owner of Foci, a fashion brand, complained. “We have been making every effort to build up our fashion brand for nearly 10 years, and we cannot set up our shops on small alleys,” she added. “N” related that she had rent a 42 square meter kiosk on the second floor of Vincom shopping mall, where she had been selling fashion products until the shopping mall’s management board asked her to move to another place. N does not feel satisfactory with the new kiosk, located on the ground floor B2, which fronts the stairs. She believes that the new kiosk is located disadvantageously, because few people visit the place. However, she cannot find any better place to move to. One year ago, when signing the contract on renting retail premises with Vincom, she agreed to the provision that the shopping mall has the right to move the retail premises. So, if N does not lease retail premises here any more, she would lose the deposit money. “I have been doing business in the central area of HCM City for the last 20 years, but I have never felt such big difficulties in looking for retail premises,” N said. N once set up her stalls at Intershop, but she cannot return there, because the shopping mall, which got burned and the re-construction has not been kicked off. Meanwhile, Eden is still under construction, while Parkson, Diamond and Zen Plaza only accept the clients who trade products of well-known brands. Only Vincom accepts small merchants like N. Therefore, despite the high rents, she still accepted to lease the premises, accepting losses over the last year. District 1 is considered the commercial hub of HCM City. However, it is not easy to find retail premises in the area. Kumho Asiana Plaza Saigon has closed its doors and shifted the business model. After that, Lucky Plaza also followed the move in July 2011. Some small merchants, who once rent kiosks at Lucky Plaza, have moved to Taka Plaza on Nam Ky Khoi Nghia Road, where they have to pay the rents double than that at Lucky Plaza. It is clear that they will have to accept losses for some more time to find loyal clients before they can make profits later. Bao, the owner of a jewelry kiosk, said that she spent 10,000 dollars to obtain a kiosk there. However, as the sales went too slowly, she has transferred the kiosk to another merchant at just 4000 dollars. It is expected that three retail centers will be put into operation in 2011, including The Crescent, Bitexco Financial Tower and The Manor which can provide 36,000 square meter of floor area. Bau of Foci said that the purchasing power of fashion products is just equal to 1/3 of that in the last year. Meanwhile, the retail premises rents have been increasing. In the first six months of the year, the total retailed goods and services increased by 21-22 percent over the same period of the last year. However, if not counting on the price increases, the actual figure would increase by 7 percent only, a modest growth rate if compared with that of the previous years, at 15-20 percent, according to Dinh Thi My Loan, Secretary General of the Vietnam Retailers’ Association. The low purchasing power and the high premises rent both have forced retailers to raise the sale prices. With the rent of 3000 dollars a month, every day, a retailer has to pay 2.1 million dong at minimum. Previously, when 5-7 products were sold a day, buyers had to pay 300,000 dong for premises rent. Meanwhile, as the demand is low, and only 10 products are sold a week, the cost for premises would be nearly one million dong. VNRE – German-invested wholesale chain operator Metro Cash & Carry (Metro) on Thursday started work on a new center in the northern province of Quang Ninh as part of its plan to expand business nationwide. Following the opening of four new markets in the provinces of An Giang, Binh Dinh, Binh Duong and Ba Ria–Vung Tau last year, Metro will soon have a US$20 million center in the province’s Quang Ninh City – its 14th wholesale facility in the country. Covering an area of about three hectares, the new center has total sales area of 6,500 square meters and will supply over 25,000 food and non-food items and essential services. Like other Metro wholesale centers, Metro Ha Long as the forthcoming one is named will target business customers such as hotels, restaurants, caterers, traders, offices, and service companies. The new center will be opened to business in the third quarter of this year. The center will create around 400 new jobs. 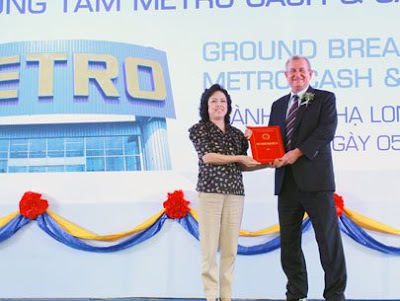 Metro Cash & Carry opened its first wholesale center in Vietnam in 2002. The company has invested more than US$200 million in the country. VNRE – More than 100 businesses from Thailand are showcasing their products at the fifth Made-in-Thailand Outlet 2011, which opened in Hanoi on April 21. During the four-day fair, Thai businesses will introduce to Vietnamese customers products such as foods, drinks, household utensils, garments, jewelries, health and beauty care products, auto and bike parts, decorations and souvenirs. Speaking at the opening ceremony, Pham Thi Hong Thanh, Deputy Director of the Asia-Pacific Department under the Ministry of Industry and Trade, said that the fair is a good chance for the two countries’ investors and producers to exchange experience and expand business cooperation. According to the Trade Commission of the Thai Embassy in Hanoi , the annual trade fair not only aims to promote Thailand ’s products but also offers an opportunity for Thai businesses to study the potential Vietnamese retail market and seek partners. The event is jointly held by the Thai Ministry of Trade, the Embassy of Thailand in Vietnam and the Vietnam Trade Fair & Advertising Company (Vinexad). VNRE – South Korean retailer, Lotte Mart (a member of Lotte Group) has signed a contract with Charm Engineering (Korea) to open business center in the Di An town, Binh Duong. Mr. Jeon Yong Ho, marketing director of Charm Engineering said, Lotte Mart will open business in Charm Plaza with 5 floors which have a total area of 12,500 square meters. Business cooperation between the two companies have 20-year period and will officially go into operation in early 2013. 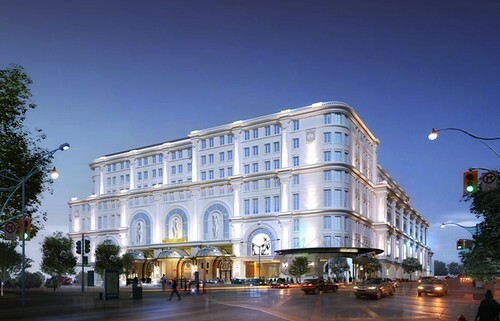 This will be the third commercial center of Lotte Mart in Vietnam after the two went into operation in Ho Chi Minh City. Charm Engineering will invest about 200 million U.S. dollars into Charm Plaza project. Build on an area of 50,000 square matters, Charm Plaza will have gross floor area of 363,000 square meters. After completion, Charm Plaza will include 2,700 apartments, commercial center and other facilities. 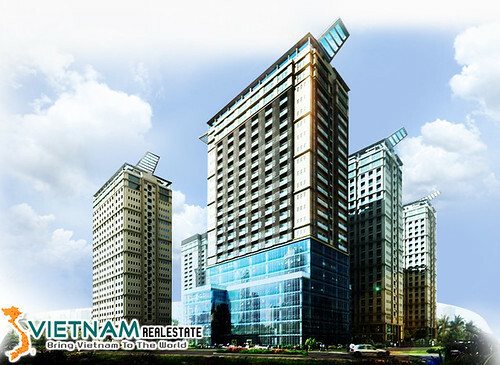 This is also the first real estate project which Charm Engineering invests in Vietnam. Currently, Charm Engineering is investing seven real estate projects in Vietnam with total registered capital of about 895 million U.S. dollars.